A while back, I got a book from my Skillsoft learning library, with the following title: The Science of Marketing: When to Tweet, What to Post, How to Blog, and Other Proven Strategies. As a statistician/analyst at a university, I was curious about how the statistical techniques that I use on a routine basis are applied in the marketing and social media world. The author, who works with Hubspot as a social media scientist, examines several of the more popular social media platforms, via large data sets, to see what really works. The book was written in 2013, so some of the findings may no longer apply, since the social media world is a fast moving world. Nonetheless, I found them interesting, especially the Twitter chapter. I summarize some of his results below, with my own thoughts in italics. Naturally, if the book interests you, you should go to the source. The Amazon link is given above. The book sells for about 13 bucks, and about 20 bucks in paper. Note that he also delves into many other social media platforms and strategies, so the Twitter stuff is only a small part of the book’s content. · Engaging in conversation does not generally lead to more followers. In fact, his analysis of many millions of tweets and accounts shows that “highly followed accounts tend to spend a lower percentage of their tweets replying to other accounts”. o Accounts with 1000 or more followers had about 8% of their tweets preceded by the @ sign (i.e. were conversational). Accounts with less than 1000 followers had about 16% of their tweets preceded by the @ sign. A similar trend was evident when examining accounts with greater than a million, vs less than a million followers. o This seems reasonable, given the difficulty of actively engaging with a large number of followers. After all, a twitter account holder only has so much time and attention. The more time devoted to conversation, the less time that can be devoted to more the more general content, that builds audiences. · Highly followed accounts tend to have a lot of tweets that contain links. o For accounts with 1000 or more followers, about 45% of the tweets contained links. For accounts with less than 1000 followers, only about 12% of tweets contained links. o This also seems reasonable. An account that appeals to a large following probably can’t be too personal – there are just too many people. But it can be informative, interesting, educational or authoritative on some subject. That is what can generate followers (unless you are a celebrity, in which case the minutiae of your life may hold wide appeal). · More tweets are better for building an audience. o When he looked at the number of tweets per day, vs the number of followers that the account had, the number of followers peaked at about 22 tweets per day. It didn’t fall off very quickly from that point. So, the takeaway is, it is hard to over-tweet. o This also seems reasonable, at least within certain parameters. You need to repeat messages, to have them heard in a crowded room. But, you have to avoid coming across as a spammer – it alienates people and Twitter doesn’t like it. Rich content also helps – if the content is good, repetition is probably tolerated better. · Accounts with a higher percentage of self-referential tweets have fewer followers than accounts that don’t talk about themselves too much. o This also seems reasonable. You had better be an intrinsically interesting person, if you expect a lot of people to be hanging on your every thought or action. Again, what works for celebrities doesn’t work so well for the rest of us. · Accounts with a higher percentage of negative sentiment have fewer followers than accounts that are more positve. o Again, this seems intuitively obvious. Most people don’t care for a lot of negativity (though a smattering of it is ok). · Accounts with a picture/bio/profile get more followers (250 on average vs 25). o Again, this seems intuitively obvious. It is harder to trust people who seem to be holding back. Of course, not including a picture/bio/profile might also be a sign that the account holder isn’t all that social, anyway. · Tweets with links get more retweets than those without links. o That seems reasonable, as retweets are often about sharing content. · People retweet tweets with links, even though they don’t necessarily click on the link themselves. So, a catchy headline is important. o Interesting, and rather counter-intuitive. · Asking for retweets is effective. o Calls to action work. · Tweets made in the late afternoon (3-5 Eastern Time) get a higher percentage of retweets, than other times of the day. o People are tired at the end of the day, so retweeting is a nice way to stay engaged without working too hard. · Retweeting peaks on Friday, though tweeting in general peaks earlier in the week. · Tweets with novel or unusual content get more retweets. This was determined via text analysis (the percentage of words in a tweet that were not common words). o People like to be the first to share new information. · Longer tweets have higher CTR. o Longer tweets are more likely to have something “clickable” to look at. · Tweeting at widely spaced intervals through the day leads to higher CTRs. o Quick bursts of tweets are more likely to have at least some of them missed (maybe people are busy clicking on the previous tweet?). · Tweets with more action words (i.e. verbs and adverbs) have higher CTRs. o Similar to the “call to action” phenomenon? · Tweets on weekends had relatively high CTRs. o People have more time to click through and read content on the weekend. I should note that some reviewers objected to referring to these findings as “science”, since they are correlational in nature, and therefore don’t really speak to causation. That’s true – findings based on observational data frequently have that knock against them. But, given the nature of the phenomenon, it is difficult to set up experiments, so it seems to me that observational data is the best one can hope for. Better that, than theorizing uninformed by data. 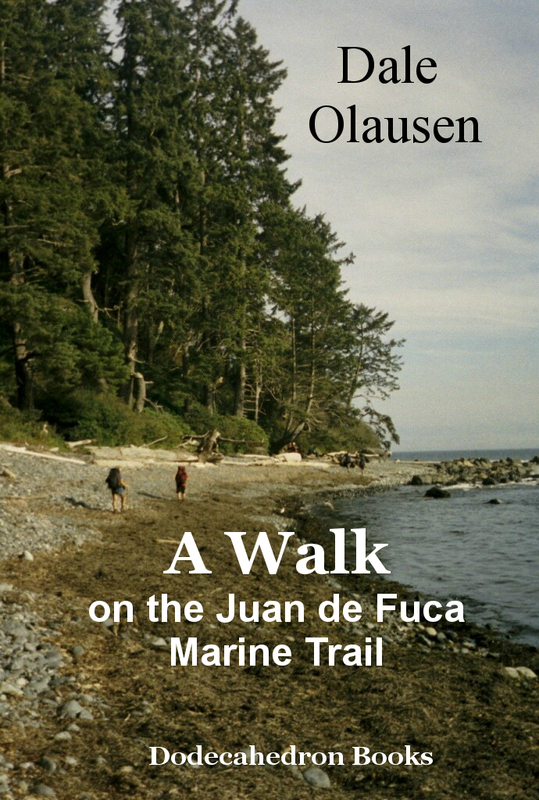 The hiking journal "A Walk on the Juan de Fuca Trail" is available on Amazon for 99 cents. Here is a summary. The Juan De Fuca Marine is considered by many to be one of Canada’s finest hiking trails. It hugs the southwestern shore of Vancouver Island, between Jordan River and Port Renfrew for a distance of about 48 kilometres. Like its (perhaps) more famous neighbouring hiking trail just to the north, The West Coast Trail, it features both beach and forest hiking along a rugged coastline. The hiking is a nice test of one’s fitness, the views are spectacular, the wildlife (marine and forest) is plentiful and the people are friendly. What more could one ask for? What follows is a journal of a five day trip, taken in early September of 2002. It is about 13,000 words in length (60 to 90 minutes reading), and contains numerous photographs of the trail. There are also sections containing a brief history of the trail, geology, flora and fauna, and associated information.